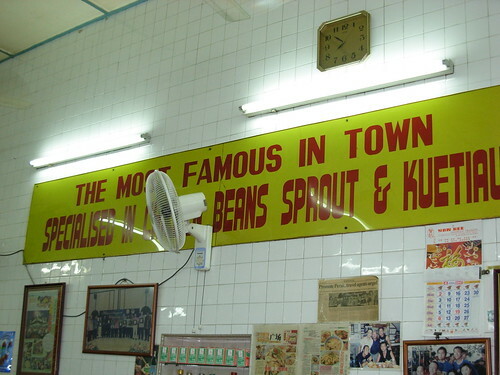 Ipoh is well-known for its food. 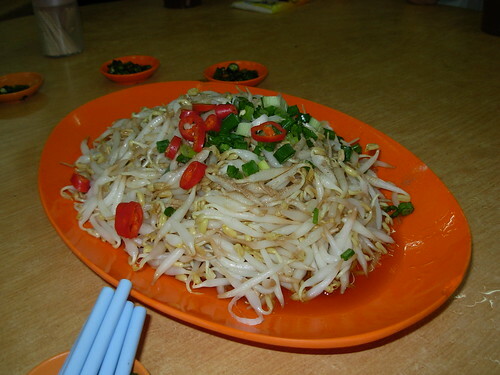 One of the most famous dishes from Ipoh is the Ipoh Ngar Choi Kai, or Ipoh Bean Sprout Chicken. 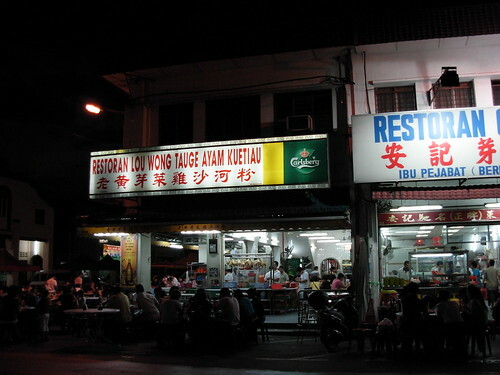 Every time my family visits Ipoh, we try to have a dinner at the famous Lou Wong Ngar Choi Kai restaurant in town. This one is supposed to be the original (equivalent to our own Jalan Kayu Roti Prata) In recent years, many other stalls and restaurants have ‘sprouted’ up in Ipoh offering this same dish, including one just next to it called Onn Kee as you can see from the photo below. Personally, I am not choosy; but one of my Ipoh brothers-in-law always insists on Lou Wong. He is a friend of the boss there. Another brother-in-law from Kuala Lumpur loves this dish so much that whenever he goes to Ipoh, he must visit this restaurant. In fact, I heard that he once made the three-hour drive to Ipoh just to satisfy his craving for this dish. And I thought that we Singaporeans are crazy about food. By the way, in case you are wondering; my wife has four sisters. She is number 2. Two are married to Ipoh guys, 1 to a KL businessman and another 2 to Singaporeans. Every December we try to have our ‘reunion’ in Ipoh. For you foodies, please don’t ask me for the address of Lou Wong. I always have difficulty remembering Malaysian road names. But that’s not to say I do not know where it is. The only road name that I can recall that’s near to it is Jalan Yang Kalsom. 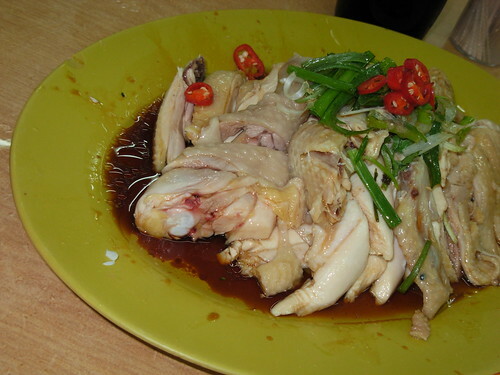 The way the Ipoh bean sprout chicken is eaten is quite different from our Singapore chicken rice. In the first place, they don’t usually eat it with rice. 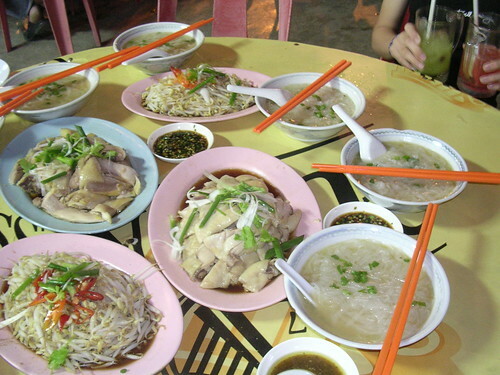 Instead it is usually eaten with kueh teow in soup, or what Ipoh people call ‘fun’ – short for sar hor fun, and the bean sprouts of course. In addition, we usually order a bowl of fish balls to go with it. 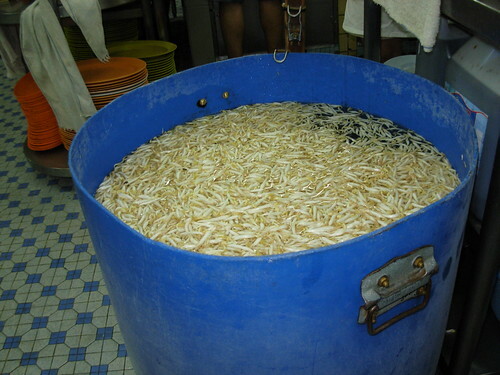 Ipoh people call it ‘yu tan’ or fish egg to be more precise, whilst in Singapore we call it ‘yu yuen’. The chilli they use is also quite different. Instead of chilli sauce, they take cut green chilli on a plate mixed with garlic and light sauce. I am sorry that I not good at describing food. Let’s just say that it tastes great. Anyway, they say a picture is worth a thousand words. So I show you some photos instead. If you want more, just go to Flickr and do a search and you will certainly be able to see better photos than mine. I felt at bit silly taking out my camera to take these photos. But judging from the reaction; or rather, non-reaction of the other customers and the restaurant staff, I can say they are pretty used to people taking pictures in the restaurant. Just look at all the newspaper cuttings on the wall. I shall end with a funny story relating to the Ipoh Ngar Choi Kai. Not far from my house, at the junction of Jalan Pasir Puteh and Jalan Bunga Raya, there is a food centre. One of the stalls sells Ipoh Ngar Choi Kai of quite good standard. So one evening we decided to eat there instead of driving all the way to town. Whilst ordering the chicken, the stall owner recommended us another chicken dish. It had a rather fanciful name. Ipoh hawkers are very creative in coining names for their dishes. Remember the Four Beauties of Big Tree Leg. Anyway, when the dish arrived, we asked the hawker what is so special about this dish with the fanciful name. He said. “This is a special chicken dish from Singapore.” We almost burst out laughing, but restrained ourselves in order not to embarrass him! In writing this blog, one of my biggest frustrations is that I do not have the photos to illustrate the places I try to describe. For example, I wrote about the cemeteries of Pek San Teng or Kampong San Teng before it was converted into Bishan new town. How I wish I had some photos of what it used to look like – the hills with rows and rows of tombstones, the pavilions and even the traffic jams that took place every Qing Ming. Many young people of today have no idea what Singapore looked like one generation ago. In his National Day Rally speech, PM Lee Hsien Loong announced exciting plans to transform Singapore. Add to that the ongoing Enbloc madness, and I fear that the next generation of Singapore will also have little idea of what Singapore looks like today; especially the many lesser known places. Let me give you an illustration. 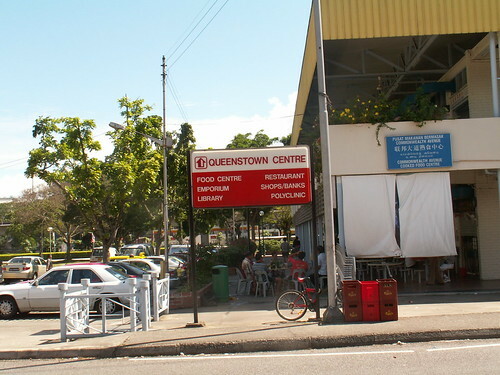 I was at the Queenstown Library the other day and parked my car at the multi-storey car park next to NTUC Fairprice supermarket. I noticed that the car park was practically empty. The reason was obvious. Many of the nearby shops have either disappeared or shut down. Before long this place will be transformed beyond recognition. Fortunately, I had my camera with me and managed to capture some shots for you to enjoy. But unfortunately, the batteries ran out after a while. Anyway, the point I am trying to make is this. Take the advice from Paul Anka’s song, Times of Your Life and “gather moments while you may”. Take out your digital camera and take some photos of places in your neighbourhood that you think will be gone soon. Better still; do what my friend Kenneth is doing and document them in your blog. Your children will thank you for it. OK. Enough words. Here are some photos of Margaret Drive in Queenstown, taken on 23 August 2007. Enjoy them because they will be gone before you even notice it. This signboard is next to the Hawker Centre. Three of the 6 items listed are no more: the emporium, shops/bank and restaurant. This is a very old hawker centre. The most famous stall here is the fish ball noodles stall. On the upper floor, there used to be a POSB branch. On the left is a wet market and on the right is the hawker centre. There used to be a 3-storey building (Block 40B) in between. Top floor was a Chinese restaurant famous for its tim sum. I think it was called Golden Crown. 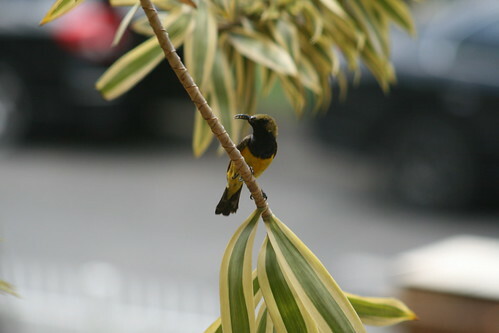 They were relocated to the Safra branch at Bukit Merah. They had an outlet selling tim sum on the ground floor. I used to buy from them when I had a gathering at my home. On the second floor was a Chinese emporium. On the ground floor was a coffee shop and a Mont’ Dor cake shop. Here’s another shot taken from the hawker centre. This building is just next to the NTUC Fairprice supermarket. 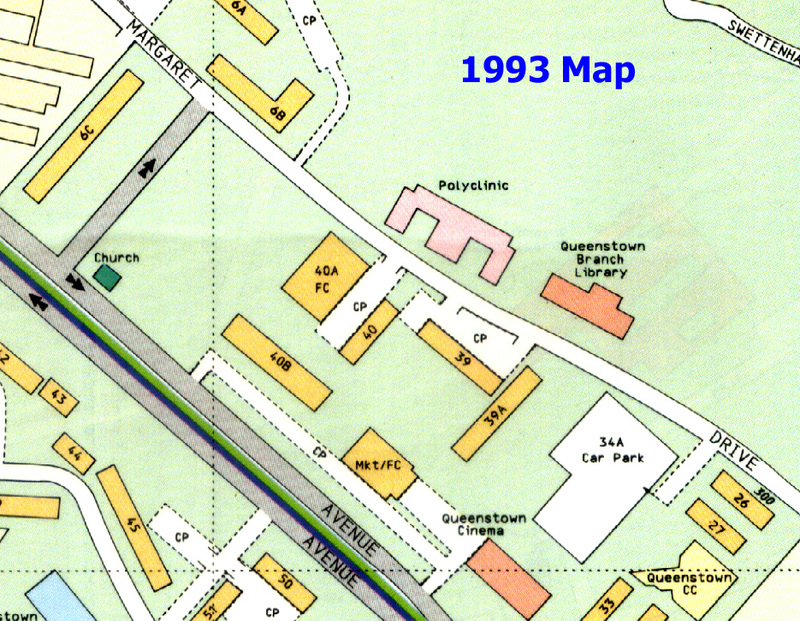 It used to house 2 (I think) cinemas – Queenstown and Queensway; Plus a bowling alley and a KFC restaurant. On the left is the Fisherman for Christ church and on the right is the Church of Our Saviour. Do you know that both buildings used to be cinemas? The one on the right was called Venus; but I cannot remember the name of the one on the left. This photo shows the hawker centre at the top. Previously there was an HDB Block 40 blocking your view. On the ground floor, right hand corner was a Standard Chartered branch. To the right, at right angles to Block 40, next to the car park was Block 39. On the ground floor, at the corner was a Maybank branch. I used to have an account with them. Further to the right, on the other side of Margaret Drive would be my favourite National Library branch; the Queenstown branch. Along that stretch of road, there used to be many HDB apartment blocks. They have all been torn down. There are now only 2 blocks left. One of them is Block 39A. 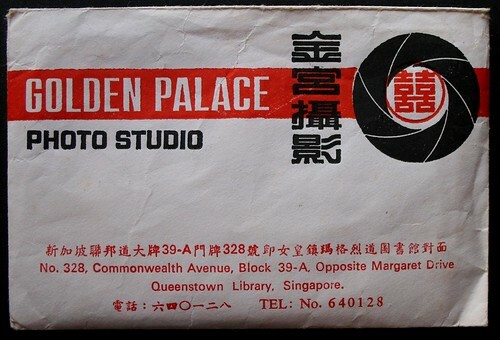 There used to be many shops at the ground floor including one photo studio called Golden Palace. Notice that their telephone number has only 6 digits. Please feel free to download these photos and add them to your collection. You may want to show them to your grandchildren one day. Our main stream newspapers certainly waste no time to drive home the message so clearly broadcast by our Prime Minister in his National Day Rally speech. Since you ‘old fogeys’ refuse to kick the bucket by your expiry date, then you better get off your butts and do some useful work instead of sitting around counting fingers. The Hokkien folks put it more pointedly, Chia Par Tan Si or gorge yourself full and wait to die. Get yourself a job dude! Any job. Both the Straits Times and Today carried articles painting a dim scenario of a “future ‘old’ Singapore” where many old folks have outlived their usefulness and could not find anything to do. I find the Today article particularly demeaning. Although couched in nice polite language and bearing a politically correct title, Tabitha Wang's article Respect our old fogey warriors... is mostly a reinforcement of the ugly stereotypes of old people. She began her article by narrating an incident in the MRT train where an old chap felt insulted when she offered him her seat. Then she went home and promptly wrote an article, outwardly praising the old people, but actually insults them, especially the old men, by drafting a list of all the popular stereotypes of old people. They have lousy memories and are complete idiots when it comes to IT. Apparently the only jobs they are capable of doing are cleaning at hawker centres. And at home they drive their wives crazy and are even responsible for the rising divorce rates among older folks. However, she mercifully spared the dirty old men who liked to splurge their CPF savings on young ladies of the night both at home and abroad. I learned one thing from the article though. Old folks are not the only people who like to do ‘wu liao’ (无聊) things like scrutinizing newspapers for spelling mistakes. Young people it appears, like to scrutinize their heads and panic at the discovery of a couple of grey hairs. Come on. Let’s look at the bright side. At least, we can look forward to achieving another world number 1 soon. With so many ah peks re-joining the workforce as you know what, we certainly are going to have the cleanest food centres on this planet. Recently, I gave up my rented office to work from home. My son was quite glad because he wanted to interview me for his Business Studies project which looks at the advantages and disadvantages of working from the home. But I didn’t count on one other advantage; which was to have regular pretty visitors. This is my work station. It is inside our master bedroom. Good thing people our age do not need much sleep. Otherwise, the bed could be a real distraction. Can you see the guava tree just outside my window? It’s what attracted the pretty visitors. 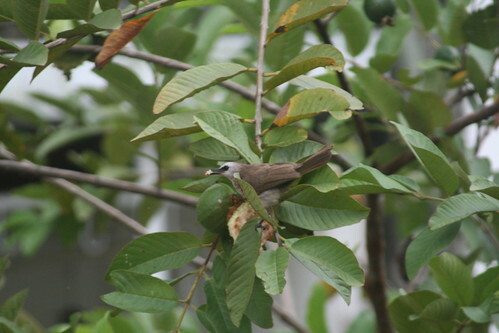 First there was this Yellow-vented bulbul. Then came this beautiful green colour bird. 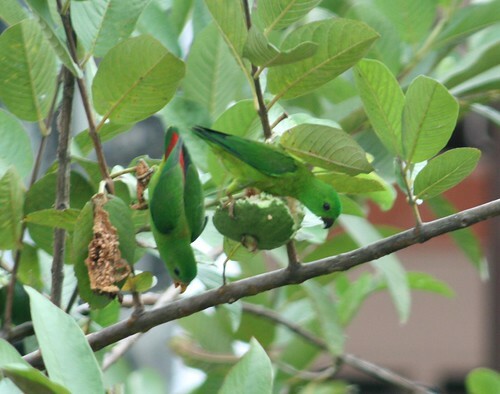 When I told my son (our resident expert on plants and animals) that we had a parrot eating our guavas, the smart alec told me it was not a parrot but probably a Lorikeet. Parrots are much bigger it seems. But thanks to the power of the internet, I was able to tell him he was wrong. 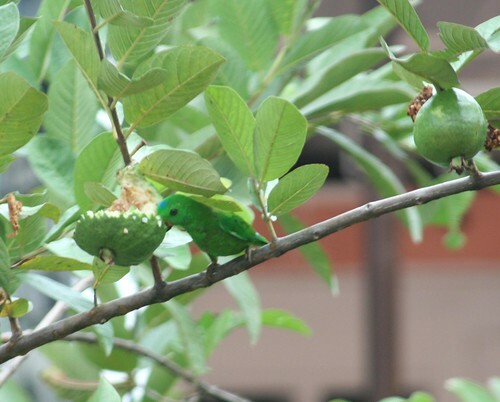 I consulted the real expert, Mr YC Wee of Bird Ecology Study Group and he told me it was a Blue-crowned Hanging Parrot. Darn .. now I have to rename my photo files. Yes lucky me. And it even brought along a companion a few days later. Walter my marketing guru friend from Yesterday.sg would call this ‘referral business’. 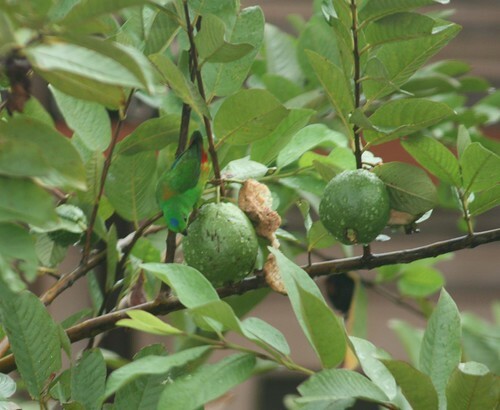 I noticed something interesting about the way it eats the guava. 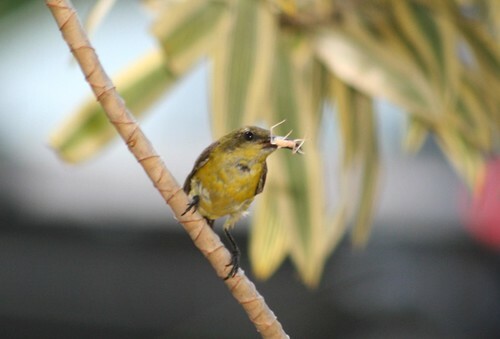 It takes a ‘bite’, bends down its head and ‘chews’ for a few second and then spits out what I think are the seeds. I thought birds always swallow the seeds and then excrete them; and thus help to propagate the plant? Anyway, I better let the experts comment on this. I have sent several photos to YC. Hope he can tell us more about this beautiful bird. PM is right. “People are living longer, we have to work longer, and we’ve to start drawing on the reserves later.” And it is good that the government has the foresight to address this problem early. As Confucius - or was that Lao Tze, who said, “If a man takes no thought for what is distant, he will find sorrow close at hand". PM has ignored one other statistical fact: 80 is an average figure! Using powerful visual aids, including one very active 81-year old lady in the audience, he painted a very rosy picture of healthy, active senior citizens. But the plain statistical truth is that a large number of people will still die before 70; and become very sick in their sixties. Exactly what is the percentage will depend on what in statistics is called the standard deviation. But we can make a rough guess that it will be at least nine thousand five hundred. I say this because, he said that there were 9,000 Singaporeans who were aged 90 and above and another 500 who were above 100. Assuming life expectancy is normally distributed with a mean of 80, then, the number below 70 should be equal to the number above 90. Thus my question is this. Is it right to tweak the entire system to cater to only to those at the healthy end of the normal distribution; i.e. those ones who will live beyond 80? How about those of us who don’t? Let’s consider a dark scenario. You are approaching 62, and have many health problems and you really don’t expect to live beyond 70. You had hoped that you could withdraw the $99,600 in your Retirement Account, to tide you over this difficult period. But now the government says that you cannot touch it for another 3 years. In the mean time, you succumb to your illnesses and that money goes to your children; assuming you have children. PM quoted a Chinese proverb; 人生七十古来稀. The Old Testament has something similar; "The days of our years are threescore years and ten; and if by reason of strength they be fourscore years, yet is their strength labour and sorrow; for it is soon cut off, and we fly away." (Psalm 90:10). I don’t see any wisdom in ignoring this sombre reminder in the twenty-first century. Take myself as an example. I am 55 and apparently quite healthy. But so was my former classmate from ACS, Ananda Rajah. Yet, some months ago, my classmates and I from ACS68 had the unpleasant experience of attending his funeral; and we realised that 4 of our friends had already departed; and that is a full 10 percent of Sec 4C! Still not convinced? Then go to the Obituaries page in the Straits Times. In today’s edition I counted no less that 6 people aged 70 and below. PM practically made no mention of the role of children in taking care of their parents financially. He did briefly mention that it is best that they stayed with their aged parents and take care of them rather than living separately or putting them in old age homes. It looks to me like PM doesn’t have much faith in the filial piety of our children. No wonder this year, he did not try to persuade us to have more children. Again taking myself as an example. I have three children. Some of my friends have no children. Certainly when we reach the end of our careers, those friends would have much more savings than I. Is it selfish or demeaning to expect that our children will at least help pay some of our bills when they become financially independent; especially when PM paints such a rosy picture about Singapore’s economic future? Right at the beginning of his speech, PM said that the best strategy is to generate more resources to help those in need – in other words, to grow the economy. I believe this strategy should apply to individuals as well. Educate your children to the fullest of their potential. Didn’t he say that for every extra year of education your child receives, his salary can increase by 14%? More importantly, teach them to "fear God and keep His commandments" (Ecclesiates 12:13) including of course Commandment number 5; "Honour thy father and thy mother: that thy days may be long upon the land which the LORD thy God giveth thee." Nevertheless, like all kiasu Singaporeans, we should not put all our eggs in one basket. So be frugal, spend wisely, keep yourself healthy, save up …. and leave the rest to God. So I was born in 1947 when the CIA, another potent force of nature, was established. My mother Doreen Martha Irene Paterson was 27 and my father Albert Thomas Layzell was a week away from his 28th birthday and serving His Majesty King George in the tropics. It was Saturday, 18th October at 2.50am, in the Queen Alexandra British Military Hospital on Alexandra Road in Singapore, during a tropical thunderstorm that caused the lights to cut out. Mum remembers it well - arriving in an Army jeep that rattled its way to the hospital driven by a barefoot Malayan about 11pm. I arrived on the top floor, overlooking the morgue. Mum and Dad by then were living in Johore Bahru so not too far to drive. Dad went home and promptly went to bed and when the hospital tried calling him about 6am there was no answer, which was rather worrying in those days as the Bukit Tima road wasn’t a safe place to be. A friend who was staying with them called Mo had to go and wake him up. Next day, Dad brought Mum a can of peaches (but no tin opener) and some rice pudding which he, in his practical way thought she would appreciate, but all the other new fathers brought flowers. Poor Mum. Sadly, my birthplace had been the scene of a tragic and horrific incident in February 1942, when Japanese troops massacred some 650 patients and staff of the hospital during their invasion of Malaya and Singapore. 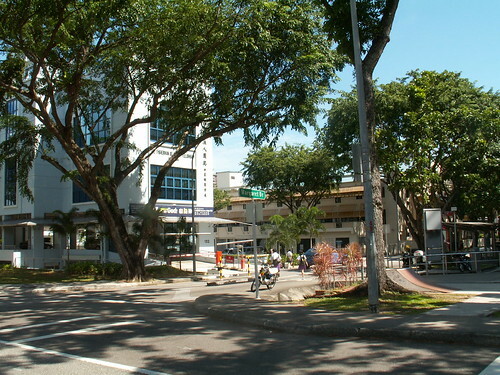 After finally being handed over to the Singapore Government in 1971, the building remained in its 1930s simplified Classical style and continues as the Alexandra Community Hospital today. And only a couple of months earlier, in August, Jawaharlal Nehru became the first Prime Minister of an independent India following the partition of Pakistan and India. The Labour Government granted them independence, obliging King George VI to relinquish his title of Emperor of India. It also granted independence to Burma and Ceylon in 1948, and gave up Britain’s Palestinian Mandate leading to the establishment of Israel and the first Arab-Israeli War. George VI reigned but all was definitely not well with the world and the British Empire was beginning to crumble. On the brighter side, it was the year of the first Cannes Film Festival. Only two years before my birthday, in 1945, President Harry S. Truman had decided to drop ‘the bomb’ in Japan to end the Pacific war quickly without the loss of further American lives. The first was dropped on Hiroshima on 6th August, and the second on Nagasaki three days later. On 14th August Japan announced its surrender. On the 8th August the USSR had declared war on Japan – nice timing. Political changes were matched by cultural changes. In 1947 Jackson Pollock dropped Abstract Expressionism on the art world with Full Fathom Five and his action-painting technique, where paint was dripped onto vast canvases laid on the floor. This was to be a great influence on my own artistic endeavours in the Art Room at Tiffin School. Princess Elizabeth, as she was then, married Prince Philip the Duke of Edinburgh in 1947 and a year later gave birth to Charles. In 1950 she gave birth to their daughter Anne, beating my Mum and Dad to it by two years. Back home in Blighty there was a Labour Government. Led by Clement Attlee, Labour won the general election in 1945 with an overwhelming majority. 1947 saw the birth of the welfare state with the National Health Service set up in 1948. On the 1st January the coal industry was nationalised followed by the Bank of England, the gas and electricity industries, the railways, and most airlines. For something like that to happen now is unthinkable. On the 1st April the school leaving age was raised to 15. The Dead Sea Scrolls were discovered, the first British nuclear reactor was developed and everything was humming! But wartime regulations remained in the UK and food-rationing in 1946/1947 was more restrictive than during the war. So my Ma and Pa were probably most grateful to be serving His Majesty in Malaya. That’s how my Mum got a can of peaches and rice pudding in hospital. God save the King! The start of 1947 had seen the most severe winter in Britain for 53 years – heavy snow and much flooding. So my Mum and Dad were doubly grateful to be in Malaya. Along with the cold weather, the Cold War was starting up nicely. At the end of the War in 1945 Germany had been divided into zones occupied and controlled by the USSR, United States, United Kingdom and France. Meanwhile, the USSR was converting all of eastern Europe into a Soviet controlled ‘bloc’. To put my arrival further into context, only four days before my birth on 14th October 1947, an American test pilot called Chuck Yeager was the first pilot to fly faster than the speed of sound. A United States Air Force officer during the War, he became a test pilot and flight instructor. Chuck flew the Bell X-1 aircraft at a speed of 1,065 km/h (662 mph), breaking the sound barrier. A few years later my mother’s sister, Auntie Pam, was to marry a USAF officer called Tom Yeager but he was no relation. Perhaps she thought Tom was Chuck? Tom, like Chuck, was certainly a fast mover but so were most American servicemen at the time as far as young British girls were concerned. My Dad, under the title of Lieutenant AT Layzell, had to travel out to Malaya on his own and was ordered to report on 6th Feb for embarkation on SS Arundel Castle at New Docks, Southampton, bound for Singapore. His orders advised him to parade in “Dress:- Full Marching Order (Battledress, Web Equipment, etc.)”. Those were the days! So my Mum had to follow him out, about 3 or 4 months pregnant, sailing for Singapore on 5th May aboard the British India Steam Navigation Company’s liner SS Dunera - 11,162 tons gross (the ship, that is), built in 1937 and kept going until 1967. She met a ‘shipmate’ on the way to Southampton, Louise, who lives near Portsmouth and who she’s still in contact with. What exactly brought my parents to Malaya? Well, I think it was an opportunity for a foreign posting that was too good to miss. Mum and Dad met at work in York. After the war Dad was working with the War Office, or Ministry of Defence, and had been posted to York in an office based in an old house. Mum, who had been in the women’s ATS (Auxiliary Transport Service) was working there as well. Although she’d been going out with a local boy (Reg the bomber pilot) she ditched him for blue-eyed Albert. When Mum and Dad arrived in Singapore, they stayed in ‘The Floraville’ Guest House not far from the hospital, run by a pock-nosed Dutchman known as ‘Van Fleet’ but probably van Vliedt who kept a gaggle of geese as guards. Staple diet for residents was boiled fish with sweet chilly sauce. Mum said he didn’t give you time to get out of bed when the first of the month arrived, the ranch doors were flung open and his voice bellowed RENT! He wasn’t very nice and so they were pleased when they moved to Johore Bahru on the mainland just across the causeway from the island of Singapore. I’m not sure how but my Mum and Dad were offered rented accommodation in one of the Sultan of Johore’s spare houses at number 27Jalan Abdul Samad. The Straits Times of 1938 reported the newly-built house as being ‘of the Spanish style’. A good start for the architect to be. I was christened by the Reverend Food there in the back garden, as my parents considered it too dangerous in those days (because of terrorist activity) to venture out to the church. I was baptised with holy water from Palestine, in a small clay phial given to my Mum by the NAAFFI Manager’s wife; she shared a cabin with Mum on the way out to Singapore aboard the SS Dunera. The water was put into a silver rimmed cut-glass fruit bowl and there was cake and champagne which, I am told, I didn’t like at all and funnily enough has never really agreed with me since. Did you see my interview with Wo Bao (My Paper)? I don’t think many of you would have seen my interview with the Chinese newspaper Wo Bao (我报) last month. The article featured interviews with three Singaporeans born before independence. One was in his sixties, one in his fifties (me) and one in his forties. The interview which was conducted over the phone was quite lengthy and spread over a few sessions. I narrated a lot about the stuff I write in this blog, such as the old places like my kampong, amusement parks like Wonderland, New/Great/Gay World, kampong life, movies and cinemas etc. Hence, I was quite surprised that the article that was finally published focussed only on my employment and career. Anyway, here’s a rough translation. In the 70’s when there were no iPods, if you wanted to listen to music and radio on the move, you would need a transistor radio like this one (right photo). 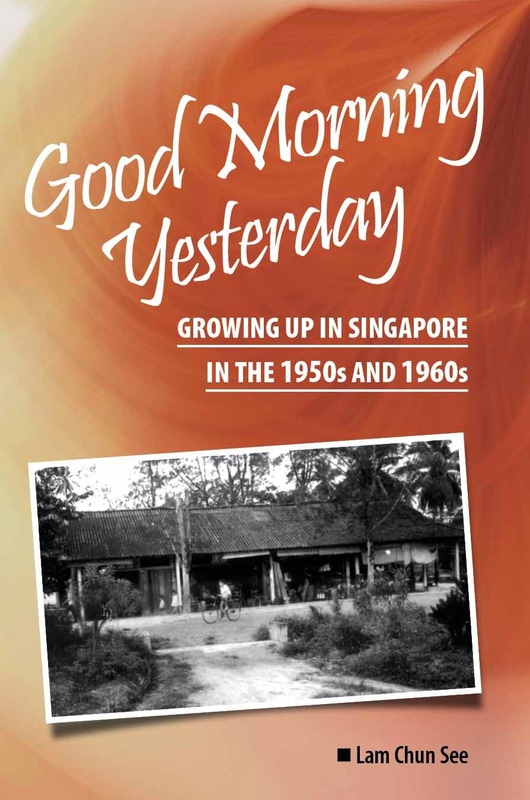 In conjunction with the launch of Singapore HeritageFest yesterday, Wo Bao spoke to 3 Singaporeans of different ages about life in those days. This university graduate found job immediately after graduation. Going on overseas assignments was prestigious. Fifty-five year old proprietor of his own management consulting firm, Lam Chun See is author of the blog Good Morning Yesterday. He likes to reminisce about the old days and has attracted a following of young readers. 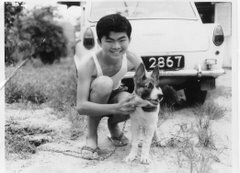 Possibly one of the oldest bloggers in Singapore, he shared with this reporter what it was like to grow up in that era. Recalling the days of newly-independent Singapore, LCS said that Singapore was facing a crisis with the imminent withdrawal of the British forces from the Far East coupled with the large number of post-war baby boomers entering the labour market. Initially, many were worried about their livelihood. But the government was quick to find a solution – inviting foreign MNCs to set up factories in Jurong. The economy grew strongly after that. Due to rapid industrialisation, the unemployment problem was largely solved by the mid-seventies. LCS was able to gain admission to the Engineering Faculty on the local university. "At that time, the number of university graduates were relatively small in number and so most were able to find jobs immediately after graduation. " LCS used the word ‘fortunate’ repeatedly in describing his own career. In those days, to be sent for overseas assignment was regarded prestigious and enviable; even if it was to neighbouring Malaysia. LCS started work in MNC, Philips as an engineer. Then he learned that the National Productivity Board was sending staff to Japan for training and so he decided to join NPB. In the eighties, the economy continued to be quite rosy (I think she got me wrong there – that should be nineties). Many public-sector employees set their sights on the private sector. LCS felt the urge to venture out on his own. You blogged about Lorong Chuan some time back, and I left a comment about an old rubber factory there. There is an old ruin still there now, round about where the rubber factory was. I'm not sure whether this might have been an old guard house at the factory or something else. These pictures were taken at the curve of Lorong Chuan, where it presently intersects boundary road, behind a row of new houses (no.258-260). The ruin is just visible from the main road when driving by. I think the weekly Sunday Times column, English As It Is Broken, serves a useful purpose to point out some of our common mistakes in the use of the English language. But I find that lately, they seem to be trying too hard to inject humour into the column, and this is at the expense of clarity. I think they should devote more space instead, to explaining the mistakes. Let’s take today’s 3 cases as examples. It was pointed out that just because the two words Part and Time end and begin with the letter ‘t’, it does not mean that we can join them to form a single word ‘partime’. This was helpful as many of us may not be sure about this rule. However, the writers should have gone one step further to elaborate that there isn’t a single fixed rule for joining two words to form another word. For example, it is perfectly alright to join Pass and Time to form the word ‘pastime’ and not ‘pass-time’. Here again, the writers wasted a lot of space to create a story to illustrate the incorrect use of the word ‘follow’. It would have been more helpful if they had simply explained the different applications of the word ‘follow’; for example to physically follow somebody as opposed to following his instructions or example. I believe this one is not broken English at all. It is perfectly good Singlish which every Singaporean would understand. And I suspect, even the best (Singaporean) English professors would use it in daily conversation. Again, instead of writing a lengthy story of how the expression is used, they have should devoted some space to explaining the origins of this Singlish expression. I believe it is a direct translation of the common Chinese phrase 哪里有 or ‘pin-toe-yau’ in Cantonese, or ‘toe-lok-oo’ in Hokkien. In fact, you frequently find this same expression - mana ada, being used in Malay. 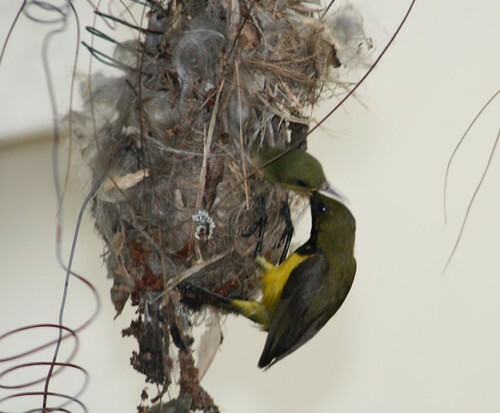 My children are all still schooling and already I am experiencing (literally) the empty nest syndrome. This morning my twins flew away without warning; but not without fanfare and drama though. 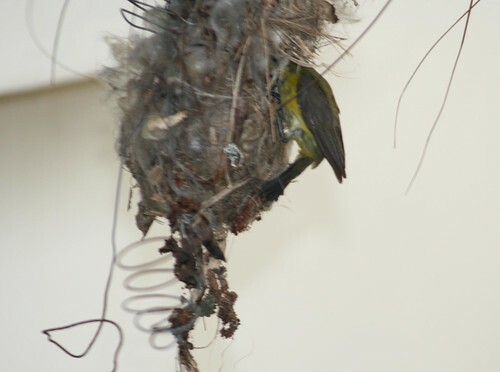 My wife was pottering around in the balcony, just next to the nest when one of the chicks suddenly flew out of its nest towards our neighbour’s bedroom. She panicked and ran downstairs to tell me. 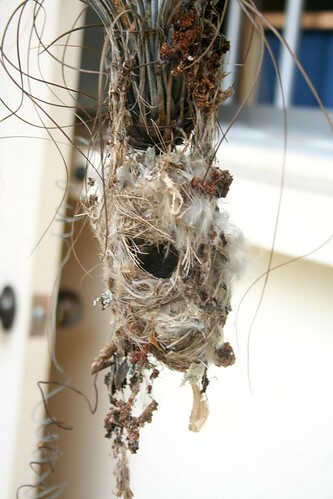 Like all anxious parents, we were wondering, would it be able to fly properly, or would it be stuck in our neighbour’s house. 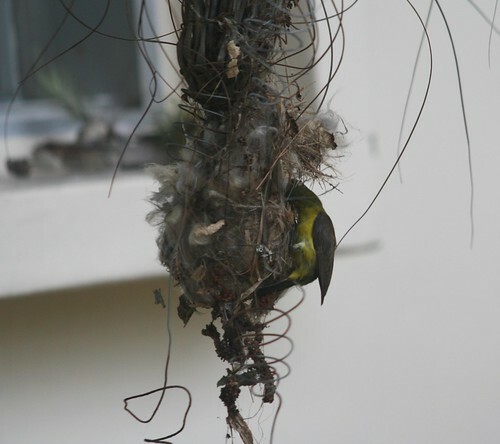 Meantime, the biological parents were making a racket in the garden. 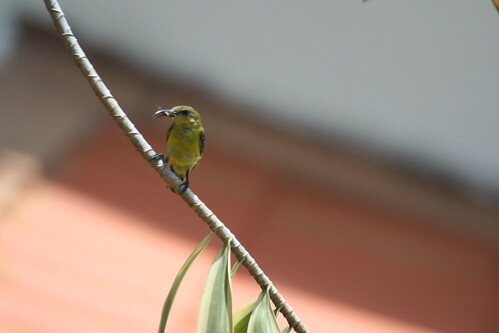 And then we spotted a young sunbird chirping among our pitcher plants. We knew it was one of the babies: but which one? I quickly ran upstairs to get my camera and even went quite close to take this shot (below), but still it remained there; fidgeting and chirping. And then it flew off. We were in a fix. Was that no. 1 or no. 2? If it was no. 2, then no. 1 would still be in our neighbour’s bedroom. 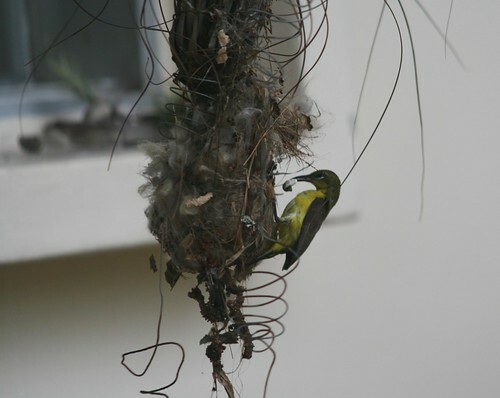 I rushed up to my balcony to check the nest, and was relieved to see a single chick in the nest. I moved closer to take a photo, but before I could take my second shot, it flew off. 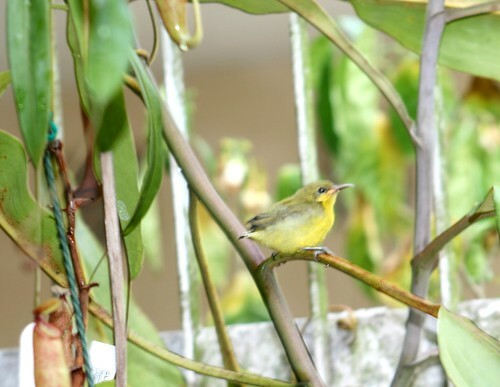 And thus bringing to an end our close encounter with the sunbirds which began here. 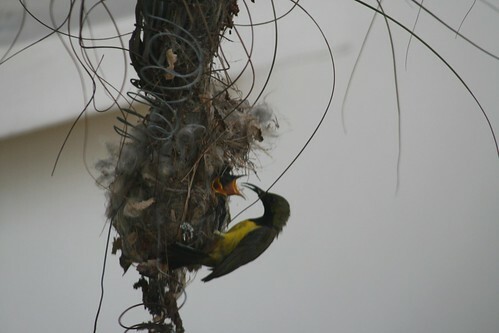 In the meantime, the parents continued to chirp excitedly in our garden. Chuck was right. We should have given the babies names. But then with only their heads sticking out, we could not tell the twins apart. Justcate was also right. Letting go would not be easy. One question remains. 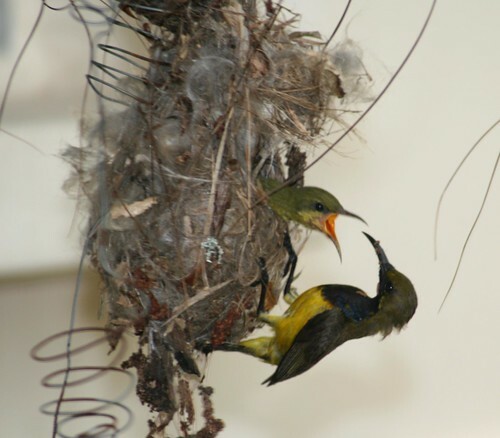 What do we do with the empty nest? My thanks to Leaf Monkey for sending me 2 sets of the Heritage Trail booklets on Balestier, Jalan Besar, and Bukit Timah. It was a gesture of appreciation for my inputs about the old Bukit Timah area. My friend Peter Chan too received a set. I have just completed reading the booklet on Bukit Timah. I must say that I am very impressed with what a great job they (the National Junior College students and Leaf Monkey) have done. So many interesting facts and photos in such a small document. I really learnt a lot of new information about an area I have lived in for the past 23 years. What I like most is the history of names of the roads. When I was blogging about the Beauty World, I lamented that I couldn’t find any information about it in Singapore Infopedia as well as the Singapore Encyclopedia. But thanks to the initiative of this group of young people, others will not have this problem. I suppose that, owing to the lack of space, the authors had to leave out many places along this very old part of Singapore. So I am sure they will not mind my mentioning just a few of what I think they should have included in the brochure. Anyhow, my friend Peter and I are thinking of writing a series of articles here to supplement the information contained in the booklet. But we are still at the planning stage. OK. Here are my thoughts of some of the places that should have been included. The booklet had quite a detail write-up of the existing schools; but being a heritage document, they should have included schools that used to be there. I am thinking of course of Whitley Secondary School, Swiss Cottage Secondary School and Dunearn Technical and/or Secondary School. 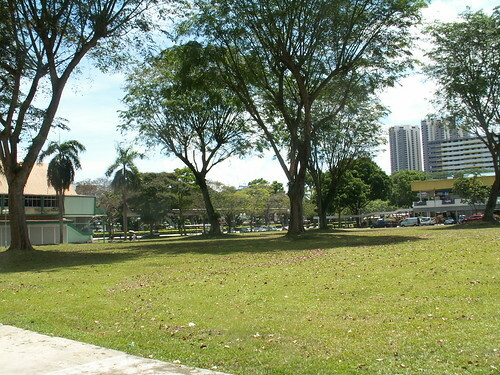 Whitley Secondary School was located at - where else but Whitley Road; where the present Singapore Chinese Girls School stands. 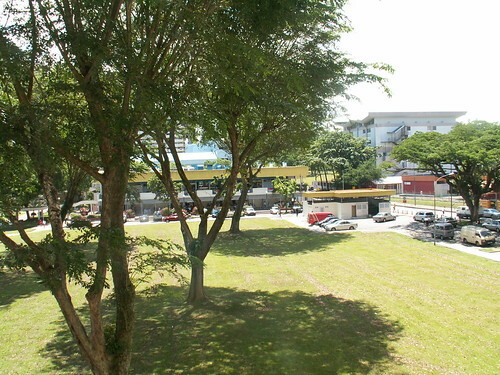 When I first got married, my wife who was a teacher at Jurong Secondary School applied to be transferred to Whitley to be closer to our new home in Sixth Avenue. She taught there for a number of years until a couple of years after they were relocated to their present premises in Bishan new town. Swiss Cottage Secondary School was located just after Whitley School; going in the direction of Newton Circus, and just before a private estate called Swiss Cottage Estate. 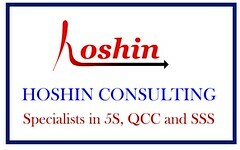 They too have been relocated to new premises. In their case, it is Bukit Batok new town. Its premises is now occupied by a private school. I think the name is International Chinese School. (see photo at right). 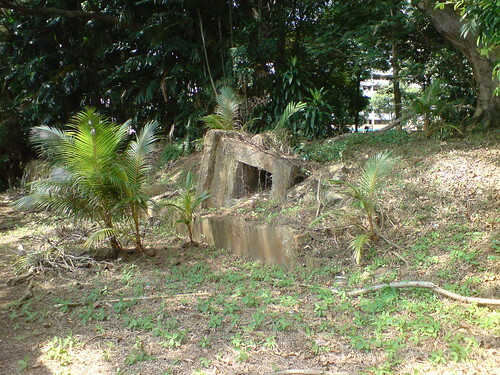 In the Bukit Timah Heritage Trail, there was quite a lengthy narration of the history of the Swiss Community. I suspect, this area of Swiss Cottage must have some connection with the Swiss Community, but the booklet was silent on that. As for Dunearn Technical, I am not very sure about the name. I seem to recall that there were 2 schools, Dunearn Tech and Dunearn Sec. 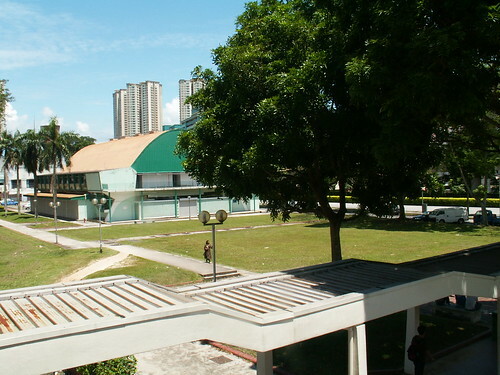 Anyway, like all pioneer-batch NJC students and teachers, I remember clearly where it used to be located. During the first few months of 1969, our college did not have its own canteen. And so for lunch, we had to take a long walk across a huge field and then climb up a long flight of stairs to dine in the tuck shop of this school. By the way, that place is now occupied by the new NJC. But my biggest disappointment was that they did not publish a photo of the iconic NJC lecture theatres. 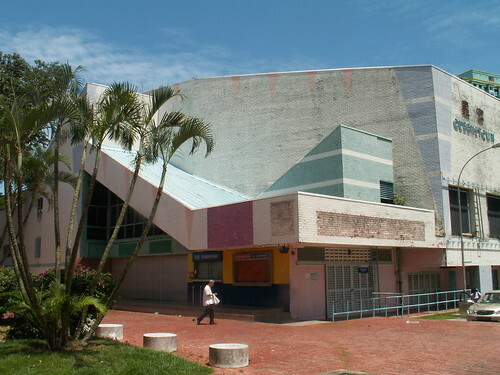 As Singapore’s first junior college students, we enjoyed the unique experience of having lectures; and our lectures were held in two adjacent lecture theatres with sloping roofs of quite artistic design. From the main road, this structure can easily be seen. Since the NJC had a key role in this heritage trail project, I thought they certainly would have included a photo of the college viewed from the main road. No mention was made of the hotels along Bukit Timah. The two most well-known ones were Orchid Inn and Equatorial Hotel. Lesser known are Garden Hotel and Sloane Court at Balmoral Road. Orchid Inn is still there, although it is now called Copthorne Orchid Hotel. Incidentally, my wedding dinner was held at the Charming Garden Restaurant there twenty-one years ago. Equatorial Hotel was located at the junction of Stevens Road and Bukit Timah Road. 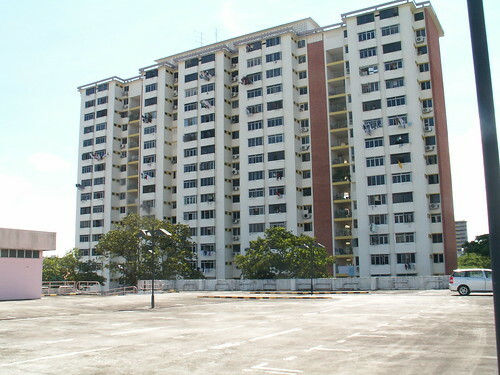 It has been demolished to give way to a condominium. Did you know that there used to be a cigarette factory known as Rothmans located at Bukit Timah Road just about where the present Tessarina condo is. There were also several other factories and commercial buildings nearby. 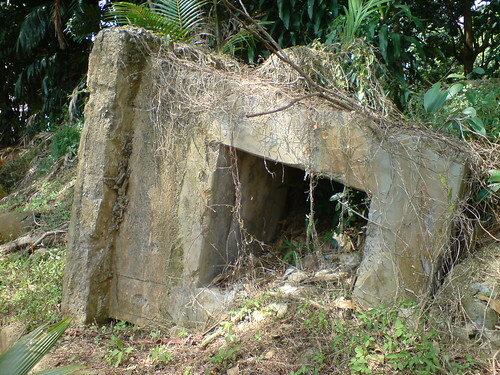 But if you want to know about these and many other interesting places along the Bukit Timah, you will have to wait till Peter and I start blogging about it. My my .. see how much they have grown. Can you spot the difference from 1 week ago. The feathers, the colours and the fully developed beaks. They need lots of proteins. Don’t rush now. There’s plenty where that came from. Chew your food properly you hear! Darn … and now to clean up mess. Good thing I know a bit of 5S and in Singapore we have this thing call baby bonus. 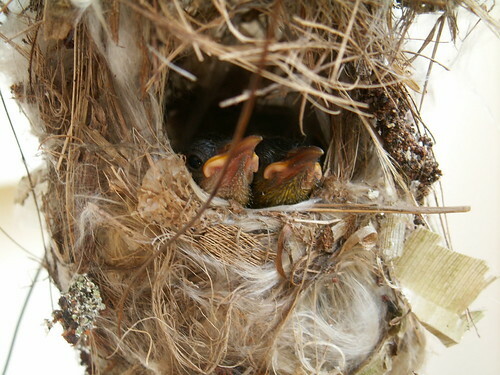 Got back tonight and was told by my kids that 2 babies have hatched and their chirps are still rather weak. Will try to confirm for myself tomorrow. Stay tuned for more photos. Today is Friday, 03 August, and the twins have reached ‘full-week’ and have grown some feathers. They have developed a ferocious appetite and mummy and daddy are kept busy all day. I noticed an interesting behaviour. 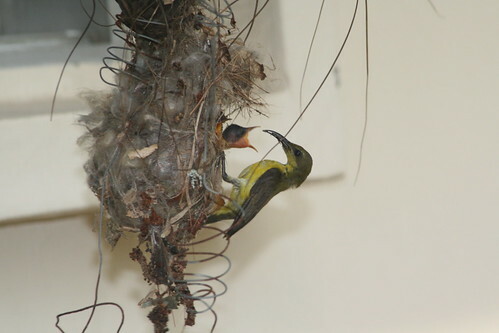 After they have found some food, they would not fly directly to the nest. Maybe, they spotted me lurking behind the curtains with my camera. So what they do (see photos below) is to first fly to a nearby branch and check out the situation for about 10 to 20 seconds. When they are sure that the coast is clear, then they will fly to the nest to feed the babies. 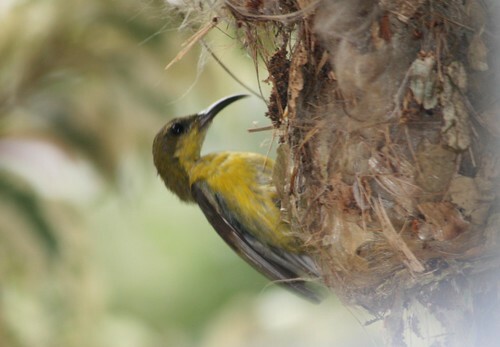 I think the one in the top photo is the female and the one with the dark chest is the male. 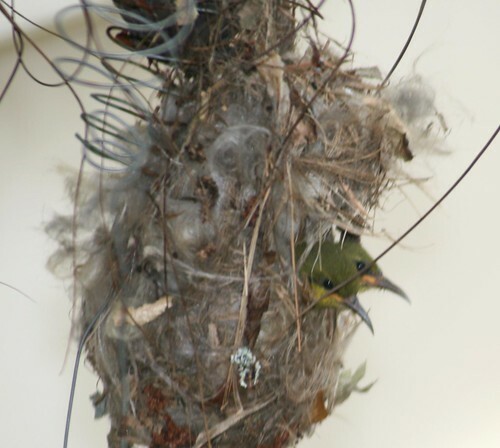 I also noticed that after feeding the chicks, it will stick its neck right inside the nest and remove some white colour stuff. Could this be the chicks’ droppings?